Among marketing strategies, writing for article directories is certainly up there. It offers a large readership with the advantage of having those readers click back to your site. While it is writing for free, it should be considered a part of your business expense, at least your time aspect of it. Just like any other form of marketing it is used to create and increase your visibility. It’s an investment. You want your title to be search engine friendly. Be sure you have your keyword/s in it–make it specific also. This is optional, because there are many writers who can write with the fly-by-the-seat-of-your-pants method. But, if you are more comfortable with an outline, that’s fine. It does provide structure. This is a popular way to go. Readers love to see simple 1, 2, 3 lists of what they should do or should Not do. Be sure to include your keyword/s in the first paragraph and a couple of times throughout the article. Just don’t overdo it. Your first paragraph should be interesting and let the reader know what the article is about, but don’t give away too much–you want the reader to continue reading. Your second paragraph or section should inform and elaborate on the first paragraph. This part should fulfill the reader’s expectations. Your last paragraph should sum up what the article is about and conclude with a lead-in to your resource box. Check the guidelines for each particular directory. The minimum word count is usually around 300-400. But, check the site to make sure. Burn-out is easy with article marketing, especially when you’re writing for your own sites also. Keeping the articles short and to the point helps in this area. Some sites allow you to include a resource box which is about you and what you can offer the reader. Check the site’s guidelines because they may have specific requirements for the length of the resource box in relation to the length of the article. Once your article is complete, submit to a number of article directories. A couple of the most popular are Ezine Articles, Associated Content, Suite101, and Helium. Note: If possible change the title of the article and at least the beginning content a bit. This will make the search engines think it’s new content. That’s about it. Write, write, write . . . 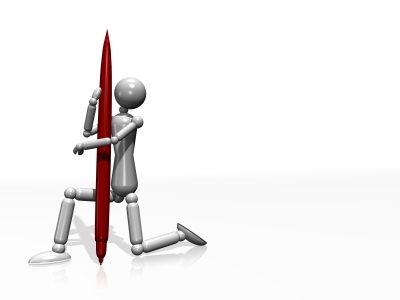 NEED HELP WITH YOUR CONTENT MARKETING OR WRITING PROJECT? While I appreciate visitors and their comments, if I don't understand the language you are writing in, I have no choice but to delete the comment. Thanks for the great tips Karen. Hey, Kristi, I'm glad you found this article useful.